The Calgary Flames did arguably more than any other team in their division to significantly improve their roster heading into the 2018-19 season, but they aren’t the only Pacific Division team that made upgrades. In terms of where they were last year to where they are now, the Flames certainly came out of the summer with a new identity and a fresh outlook for their season. Last season was a disappointment, as the team undoubtedly under-achieved, and a big reason for that was their inability to pick up points within their division. Acquiring James Neal via free-agency during the summer was a major upgrade for a team that had issues scoring goals in 2017-18. Neal has scored 20 or more goals 10 times in his career and playing with the likes of Johnny Gaudreau and Sean Monahan should allow him to continue that trend. Trading for Elias Lindholm only strengthens the Flames’ forward group and gives Calgary two solid top lines that can match up with anyone in the Pacific. The Pacific Division gave the Flames trouble in 2017-18. Calgary had a sub-.500 record against divisional opponents last season, finishing the year with a 12-14-4 record. If they have any chance of making the playoffs this year, they will need to turn the tables with regard to that statistic. That, however, is easier said than done. It seems that the California clubs may provide the biggest obstacle for the Flames this season. The San Jose Sharks, Los Angeles Kings and Anaheim Ducks are three of the best defensive teams statistically in the NHL, and while Anaheim was relatively quiet in terms of transactions this summer, both the Kings and Sharks made significant moves in the offseason to improve their offensive output and help maintain their defensive dominance. The San Jose Sharks made a big splash in the trade market on Sept. 13, 2018, when they acquired one of the best defenseman in the league, Erik Karlsson, from the Ottawa Senators. 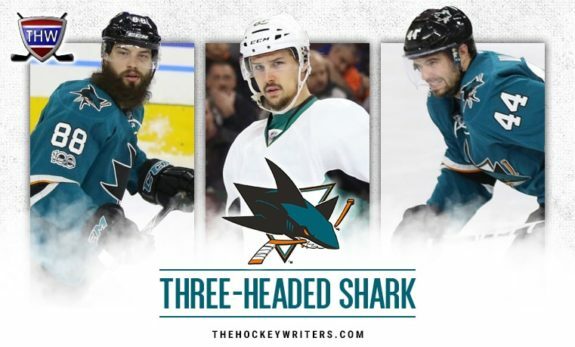 A player of his calibre should have demanded some lofty returns, however the Sharks were able to acquire Karlsson without parting with any of their main core pieces. So San Jose now has two (recent) James Norris Memorial Trophy winners on their blue line in Karlsson and Brent Burns. Burns won the Norris in 2016-17 and Karlsson has won the award twice—in 2015-16 and previously in 2011-12. If we are to imagine them playing together on the top pairing in San Jose, that means Marc-Edouard Vlasic could now slot in on the second pairing with Justin Braun, who led all Sharks defensemen besides Burns with 33 points (5 goals, 28 assists) last season. So what does that mean for the Flames? That means that it’s likely going to be a whole lot more challenging to score goals against the Sharks. The Calgary Flames and San Jose Sharks met four times last season, with the Sharks winning every game (3-0-1). Calgary allowed 18 goals against through all four games, scoring just nine goals in that span. It’s a good thing the Flames acquired more offensive weapons this summer because they are going to need every bit of it, as they will face the Sharks four times again this year. The Kings allowed the fewest goals against in the NHL in 2017-18, with 202. They are defensively sound up and down their lineup, featuring a 2016 Norris Trophy winner, Drew Doughty, who is a top defenseman in the league and can contribute offensively, as well. He finished third in team scoring last season with 60 points (10 goals, 50 assists). Kings goaltender, Jonathan Quick, was the 2018 William M. Jennings Trophy winner, so we can safely assume goals will once again be highly contested when playing Los Angeles this year. Up front, the Kings are led by 2018 Selke Trophy winner Anze Kopitar, who is coming off a career year where he scored 35 goals and 57 assists (92 points). The Flames had marginally better success against the Kings than any other Californian team last season, picking up five points with a 2-1-1 record, but they were still outscored 11-9 in the season series. The points are also a bit deceiving, because one win came in overtime, as did one loss. When it comes to playing divisional rivals, three-point games can be back-breakers and can be the difference between playing in the postseason or hitting the links early in the spring. The Ducks allowed the third-fewest goals against in the league last season (209) and should be expected to maintain that, due in large part to their solid goaltending from John Gibson. While Anaheim didn’t do much this summer to increase their roster depth overall, they were at least able to solidify their goaltending situation. The Ducks signed Gibson to an eight-year contract extension this offseason worth $52.1 million. 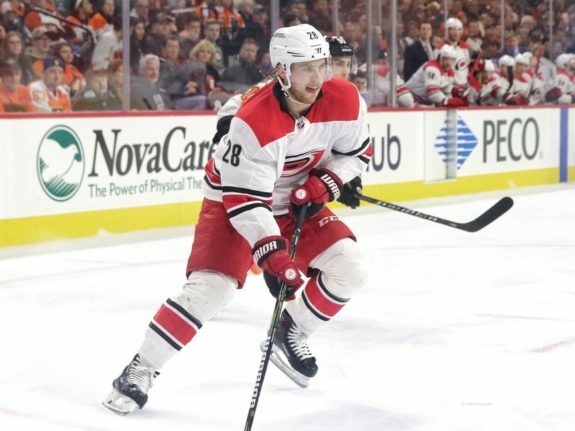 Their most recent significant offensive upgrade actually came last season, when they added extra firepower to their already potent lineup with the acquisition of forward, Adam Henrique, from the New Jersey Devils. Henrique scored 20 goals and added 16 assists (36 points) in 56 games with Anaheim in 2017-18. 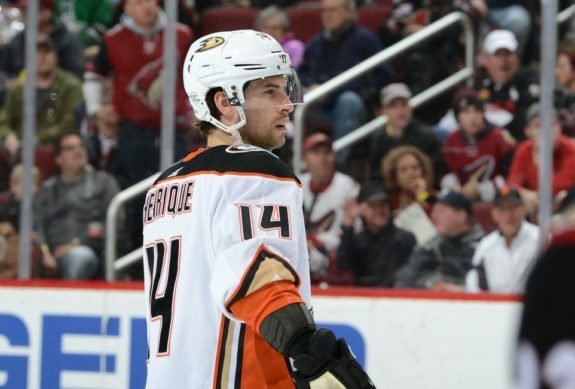 The Ducks signed Henrique to a 5-year, $29.1-million contract extension on July 16, 2018. A west-coast road trip can be a cringe-worthy proposition for Flames fans, especially when it comes to playing in Anaheim. Ask any fan who had to endure the 13-year winless drought (regular season) in the Ducks’ barn. The Flames were finally able to end their 25-game losing streak in Anaheim when they defeated the Ducks 2-0 on Oct 9, 2017, but the Honda Center is still one of the more difficult places for the Flames to pick up points. The two teams split the season series with two wins apiece (2-2-0), but the Flames were still outscored 8-6 in the process. The Vegas Golden Knights are coming off an inaugural season that ended in Game 5 of the Stanley Cup Final, and with the addition of Max Pacioretty in the offseason, it’s warranted that they are in the conversation for playoff contender once again in 2018. The Calgary Flames defeated the Golden Knights 7-1 in the last game of the 2017-18 regular season but lost the season series (1-3-0). The Flames will face the Edmonton Oilers more than any other team this season. In five games last season the two teams essentially split the series (2-2-1), with the edge going to Edmonton. Though the Oilers may have some lingering question marks heading into 2018-19 there is at least one guarantee; Connor McDavid is downright dreadful to deal with. McDavid is coming off a 108-point season where he scored 41 goals and added 67 assists. He scored a hat trick against the Flames on opening night on Oct. 4, 2017 and totaled five points in five games against them last season. The Arizona Coyotes added Alex Galchenyuk to their roster this summer, which should give them a 20-goal increase in production. Signing captain Oliver Ekman-Larsson to a long-term deal provides a refreshing air of consistency in the desert, as well. Calgary and Arizona split the season series 2-2-0 last season. The Vancouver Canucks were the one divisional opponent the Flames found consistency against, with a 3-1-0 winning record in 2017-18. The Canucks were plagued with injury last season, but if they can stay healthy they should be better this year, however, the retirement of Henrik and Daniel Sedin means young players will have to step up. Players like Brock Boeser, who scored 29 goals and 26 assists (55 points) in 62 games last season and Bo Horvat, who finished right behind the Sedin’s in team scoring (22 goals, 22 assists, 44 points) last season. While the Canucks are expected to improve this year, they aren’t nearly as formidable as the Flames’ other Pacific division foes.